Sorry this is so late in the day, but I have basically been slowed down by the overflow of total awesomeness that has occured over the last 72 hours. Isn't she pretty! 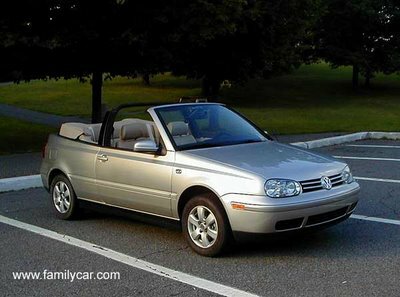 She is a 1999 Volkswagen Cabrio. This is basically what she looks like, except with black interior. Some of my more aged readers may remember her grandmother, the Cabriolet. She is also related to the Golf. More from the department of good news: Our first roadtrip together will be this Friday, when we go to Virginia beach to compete in the highly anticipated mud run! Annnnd, I will not be limping behind a walker with tennis balls on the bottom of it or anything, either. I just got back from the doc's office. And there were a lot of words used that I don't understand, but here's the information I gathered up: The lining of my my muscles is inflamed. That's pretty much it. Aparently, that's called shin splints. So, I have to be careful and listen to my body yadda yadda, but I am cleared to run and ready to rock. He said I have to add distance really slowly, about 10 percent at a time. Whatev. Also, I have to continue icing my leg like it's my job (might as well do something like it's my job right?). Once Doc said I could do the race, his words were drowned out by the roar of finish line crowd at the mud run. Yesterday, I ran THREE MILES on the treadmill.